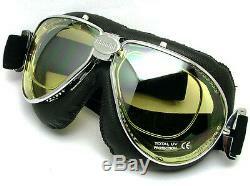 - Black Leather/Chrome Frame with. 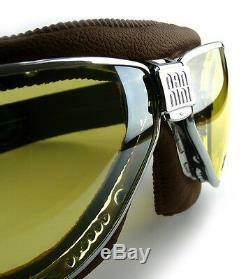 Chrome inner frame designed to support prescription lens. 60s design and drop-shape eyes get update in a new model with rounded lines. The first of our models with spherical mirror lenses on: a modern and classic charming mix. 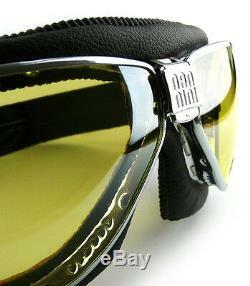 High protection lens for direct sunlight. Mirror treatment to reduce light brightness where stronger. For an accurate details perception in every light condition even when luminosity suddenly changes. QR Quick Release technology patented by Nannini: a quick lenses replacement obtained by an exclusive interchange system. 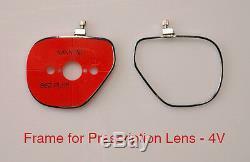 A nose bridge gear permits the lenses to be easily changed even with gloves on. Just one finger to unlock/lock it. 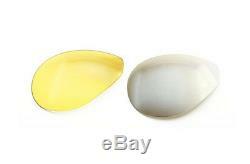 Spherical high quality lenses, developed in anti-scratch polycarbonate, light, very resistant, ensure high definition and comfort without distortions, total UV rays proof. Customer fits his own TT to all weather and light conditions. QR Quick Release technology patent by Nannini: it is a unique rapid lens changing system that allows the rider to change the lenses to suit all weather and light conditions. First choice materials and the best working techniques totally Made in Italy. Leather inside to guarantee the best contact to face, external similar leather to enhance resistance and length of the goggle, always totally hand crafted. Adjustable elastic band to stick perfectly the helmet without sliding. Display box, soft carry pouch and lenses cleaning cloth. Our story is one of Italian accomplishment, devotion and dedication. It prompted the automotive and motorcycle aficionado Giorgio Nannini to create in his laboratory specialized and innovative eyewear for driving both antique and modern cars. The idea came about from passion and a need that he shrewdly perceived and resulted in the first Nannini eyewear, which was expertly made by hand to create something new and extraordinary. This is how Compact, the Italian and international prize-winning eyewear line, was born. However, it was not until 1976, after an innovative and successful sales campaign which included talking in-store displays (a first in the industry), that the name became what it is today: well-known and appreciated world-wide, with immediate brand recognition. International market growth led to much recognition and resulted in the honour of a special exhibition for the eyewear being hosted at the MOMA in New York: Ingenious and Unique Eyewear in the World. We still hold to the same values that prompted Giorgio Nannini to start out on his fantastic adventure: passion, craftsmanship and quality that is diligently Made in Italy. For those who love history, past memories and heritage of the most dominant aviation, motorcycling and motoring themes. Specialize in historical headgear: goggles, helmets, sunglasses and costume accessories: hats, caps, gloves and garments. We are committed to providing our customers total satisfaction. Boys Ran Fast offers the following. If you are not satisfied with the product, please contact first. Otherwise all sales are final. Please pay close attention to photos and description. Additional photos or information are available upon request. Transit time can range from 2 to 5 days for Europe and 7 to 15 days for USA and Rest of the World. Boys Ran Fast is committed to protecting your privacy. We will not sell, trade, rent or disclose any information that identifies you to a third party. ENJOY OUR ITEMS AND HAVE A NICE DAY! 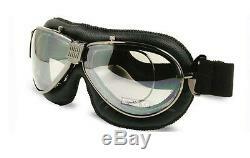 The item "NEW NANNINI TT 4V for PRESCRIPTION Italian Motorcycle Car Goggles Aviator Rider" is in sale since Wednesday, January 30, 2013. 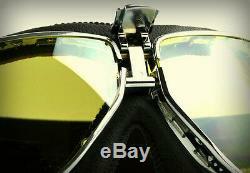 This item is in the category "eBay Motors\Parts & Accessories\Apparel & Merchandise\Helmets & Headwear\Eyewear". The seller is "lfazevedo" and is located in Portugal. This item can be shipped worldwide.